The story of liberal democracy over the last half century has been a triumphant one in many ways, with the number of democracies increasing from a minority of states to a significant majority. Yet substantial problems afflict democratic states, and while the number of democratic countries has expanded, democratic practice has contracted. 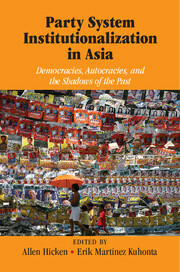 This book introduces a novel framework for evaluating the rise and decline of democratic governance. 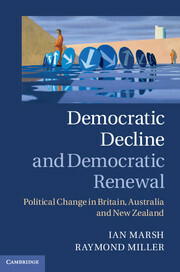 Examining three mature democratic countries – Britain, Australia and New Zealand – the authors discuss patterns of governance from the emergence of mass democracy at the outset of the twentieth century through to its present condition. 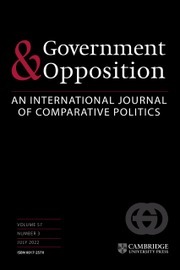 The shared political cultures and institutional arrangements of the three countries allow the authors to investigate comparatively the dynamics of political evolution and the possibilities for systemic developments and institutional change. 10. 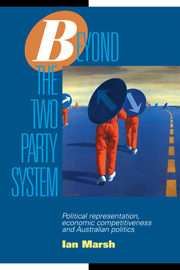 Is electoral reform sufficient? 12. 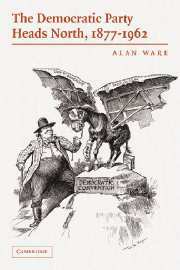 The prospect for democratic renewal. Ian Marsh is Professor in the Australian Innovation Research Centre at the University of Tasmania. 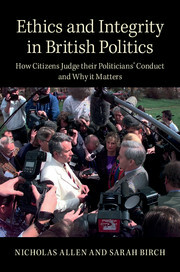 Raymond Miller is Associate Professor in the Department of Politics at the University of Auckland.